Extreame Savings Item! Save 44% on the Adventures in Raspberry Pi by Wiley at Translate This Website. MPN: 2592. Hurry! Limited time offer. Offer valid only while supplies last. 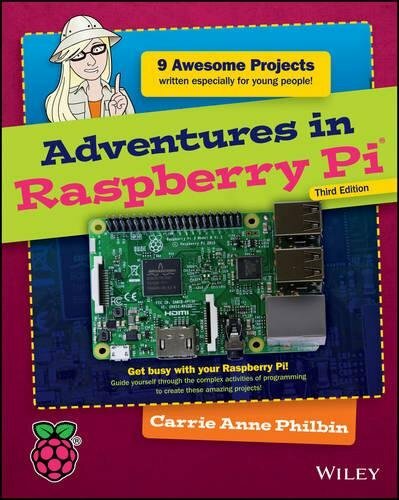 Build cool Raspberry Pi projects with no experience required!Adventures in Raspberry Pi, 3rd Edition is the fun guide to learning programming. Adventures in Raspberry Pi, 3rd Edition is the fun guide to learning programming. Starting from the very basics and building skill upon skill, you'll learn developing fundamentals—even if you've never programmed before. Learning is exciting when you're working your way through cool projects, but the concepts you learn and the skills you master will take you further than you ever thought possible. You'll learn how your Raspberry Pi 3 works and what it can do as you create stories and games, program shapes, code music, and even build Minecraft worlds with projects designed specifically for kids 11 to 15. Author Carrie Anne Philbin is a former high school teacher, and she showcases her skills with clear, easy to follow instructions and explanations every step of the way. If you're interested in programming but find other books hard to understand, this book is your ideal starting point for mastering the Raspberry Pi.